Bleach-free. Removes new & dried-in stains. Integrated brush. Triple active complex. The special Triple Active Complex is tough on stains, yet gentle on fabrics. The powerful gel does not contain bleach and is suitable for all washable whites and colours, even at low temperatures and in short cycles. 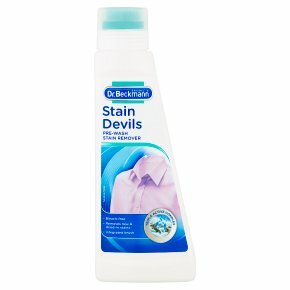 Removes Stains such as: Baby food, chocolate, blood, grease, ketchup, make-up, oil, fruit, coffee, red wine, tea, lipstick, mayonnaise... and many other everyday stains. Directions for Use Apply the gel onto the stain - for best results work in the product with the soft brush applicator. Leave to work for approximately 10-15 minutes. Do not let dry. Wash garment as normal. Rinse brush under running water to remove any residues. Important Information Before use: Test for colourfastness and compatibility on an inconspicuous area of fabric. Always check garment care label. Do not use on leather, suede, silk, wool and Dry Clean Only garments. WARNING!<br>Causes serious eye irritation. Keep out of reach of children. IF IN EYES: Rinse cautiously with water for several minutes. Remove contact lenses, if present and easy to do. Continue rinsing. If eye irritation persists: Get medical advice/attention.